Belize’s Foreign Minister and Attorney General Wilfred Elrington represented Belize at the 35th Regular Meeting of the Conference of Heads of Government of the Caribbean Community, convened from July 1-4, 2014, at Dickenson Bay in Antigua and Barbuda. According to a communiqué issued at the conclusion of the meeting on Friday, July 4, 2014 – which was observed as CARICOM Day, commemorating the founding of CARICOM on July 4, 1973 – Minister Elrington provided CARICOM Heads of Government with an update on Belize-Guatemala relations and they, in turn, expressed their continued support for the territorial integrity and sovereignty of Belize. CARICOM leaders expressed their support for the Roadmap signed by Belize and Guatemala on January 24, 2014 and witnessed by Secretary-General of the Organization of American States (OAS) Jose Miguel Insulza. The leaders furthermore called on the international community to support the efforts of both countries and the OAS. At that same meeting, CARICOM leaders approved a new Strategic Plan for the Community, which will span 2015-2019. The plan’s integrated strategic priorities include building economic, social, environmental and technological resilience; strengthening the CARICOM identity and spirit of community; and strengthening community governance along with coordinated foreign policy, and research and development and innovation. “It was agreed that [in order to ensure its] success, the Plan would require commitment and focused implementation by all the major actors in the Community – the Member States, the Organs and Bodies, the Secretariat and the Community Institutions,” said the communiqué. The movement to seek reparations for slavery was also advanced, as CARICOM Heads of Government adopted a Regional Strategic and Operational Plan for a Caribbean Reparatory Justice Programme (CRJP) as a basis for further action. At the Heads of Government meeting, CARICOM leaders approved a proposal for the region to convene the Second Regional Conference on Reparations in September 2014, in order to increase public dialogue and civil society engagement. An academic conference will also be held in late 2014. Furthermore, Heads of Government have agreed that a draft notice of complaint, under cover of a letter from the chair of the Prime Ministerial Sub-Committee (PMSC) on Reparations, Barbados Prime Minister Freundel Stuart, should be presented to the relevant European governments, requesting a conference on the issue by the end of 2014 or early in 2015. 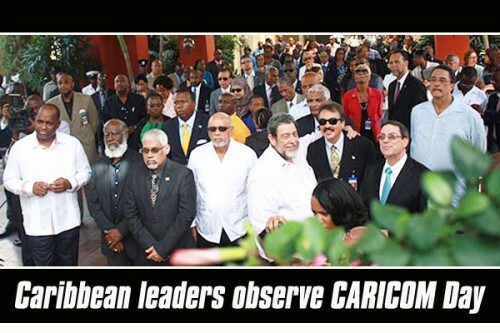 Finally, CARICOM leaders intend to proceed with the region’s case for reparations at the 2014 sitting of the UN General Assembly. On the judicial front, it was announced that Dominica would be the fourth country in CARICOM to establish the Caribbean Court of Justice (CCJ) as its court of final appeal. “The Prime Minister [of Dominica] advised the Meeting that the move away from the Privy Council would be completed once the President assents to the Act, bringing it into force,” said the communiqué. Barbados, Belize and Guyana are the only three CARICOM countries which have so far replaced London’s Privy Council with the CCJ.